There were over twenty salmon fishing drafts on the lower tidal Severn between Tewkesbury and Newnham - most of these would have fished in the manner similar to that described below at Bollow Pool near Longney. 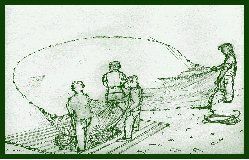 The river and fishing is influenced by the tide which sweeps up the Bristol Channel creating the famous Severn Bore at certain states of the moon. Fishing is carried out on the ebb tide which lasts for 10 to 11 hours. The flood tide pushes the river in reverse, the current and the debris in the river make fishing impossible at certain times. As the river opens out into the estuary more sea worthy craft are used where one end of the net is pulled from the boat. The net is stowed on board and transported up river against the current either pushing the boat or towing with a rope from the bank to the upstream end of the fishing draft. The 200 yard long-net was made from hemp which was heavy, particularly when wet and would also be liable to rot when stored damp, this would have filled the punt. One man, referred to as the "debut man" remains on the bank holding one end of the net. The punt is then rowed across the river with the net being cast over the side whilst the debut man remains stationary. Salmon fishing at Bollow Pool 1999. As the boat reaches a point of about three quarters of the way across the river, a weighted line is thrown to the muntle man on the further bank, this is attached to the net bridles which he ties to a canvas harness around his chest. The muntle man pulls the net down stream keeping ahead of the current. The debut man also works his way down river - both maintaining a pace which ensures the net holds a crescent shape and is not distorted by the current. 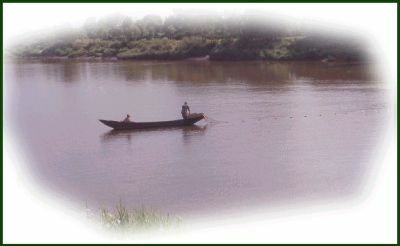 The two men in the punt row down stream ready to retrieve the ropes from the muntle man and pull the net back across the river to their original starting point - a wooden slated platform called the flake. 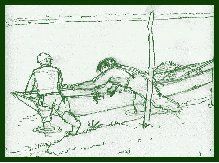 The net is hauled in often with the assistance of a hand winch as the strength of the current could pull the net out of control. The fish, if any, are swiftly despatched with a priest a length of hard wood. The net is then returned to the boat and the process is then repeated and would take about 45 minutes to an hour.